Turkish Airlines (Istanbul) flight TK 1878 from Milan (Malpensa) to Istanbul (Ataturk) today (April 25) made an emergency landing at Istanbul after the engine on the Airbus A320 caught on fire. The aircraft initially reportedly made a hard landing with the right engine and wing contacting the runway. The crew performed a go around and then made the emergency landing. According to Reuters the 97 passengers and crew members were safely taken to the terminal. 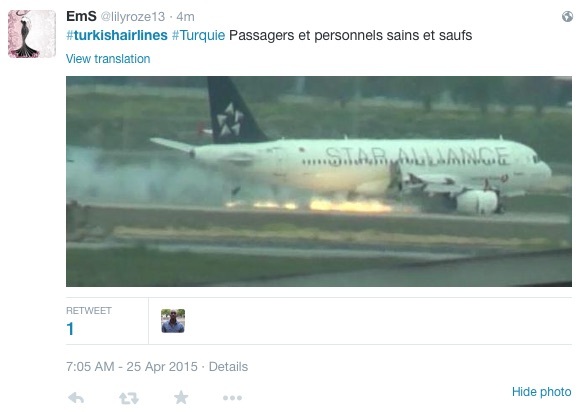 The aircraft involved is A320-232 TC-JPE (msn 2941) painted in the Star Alliance livery. This entry was posted in Turkish Airlines and tagged 2941, A320, A320-200, A320-232, Airbus, Airbus A320, Airbus A320-200, aircraft engine fire, Ataturk, engine fire, flight TK 1878, Hard Landing, IST, Istanbul, TC-JPE, TK 1878, Turkish Airlines on April 25, 2015 by Bruce Drum. During the landing flare, in gusty conditions, the commander’s prosthetic arm became detached, control was lost, and a heavy landing resulted. The aircraft was on a scheduled commercial air transport flight from Birmingham to Belfast City, with the commander, in the left flight deck seat, as pilot flying. It was night, and although there was no low cloud affecting the airport, the wind at Belfast was a strong west-south-westerly, gusting up to 48 kt. Before the approach, the commander checked that his prosthetic lower left arm was securely attached to the yoke clamp which he used to fly the aircraft, with the latching device in place. Although gusts over the crosswind limit for the aircraft were reported, the final wind report from ATC was within the limit, and the approach continued. The commander disconnected the autopilot and flew the aircraft manually. As he made the flare manoeuvre, with somewhat more than flight idle torque still applied, his prosthetic limb became detached from the yoke clamp, depriving him of control of the aircraft. He made a rapid assessment of the situation and considered alerting the co-pilot and instructing him to take control. However, because the co-pilot would have had little time to assimilate the information necessary to take over in the challenging conditions, the commander concluded that his best course of action was to move his right hand from the power levers onto the yoke to regain control. He did this, but with power still applied, and possibly a gust affecting the aircraft, a normal touchdown was followed by a bounce, from which the aircraft landed heavily. The commander commented that he would in future be more cautious about checking the attachment on his prosthesis, as his check may have dislodged the latching mechanism; that he would brief his co-pilots about the possibility of a similar event; and that they should be ready to take control at any time. Copyright Photo: Antony J. Best/AirlinersGallery.com. Bombardier DHC-8-402 (Q400) G-JECJ (msn 4110) lands at Southampton. 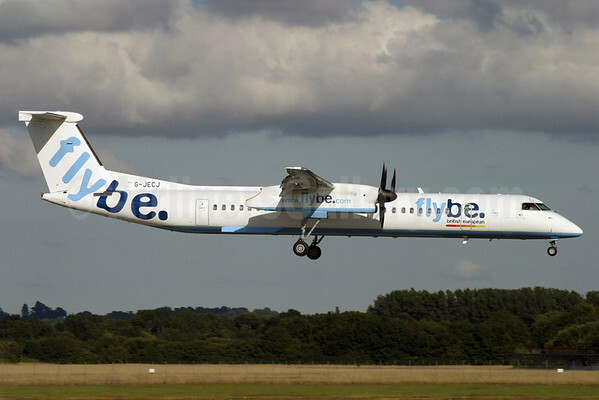 This entry was posted in Flybe and tagged 4110, AAIB, Air Accidents Investigation Branch, Belfast, Belfast City, Belfast City Airport, Bombardier, Bombardier DHC-8, Bombardier DHC-8-400, Bombardier Q400, DHC-8, DHC-8-400, DHC-8-402, Flybe, G-JECJ, Hard Landing, prosthetic arm, prosthetic limb, Q400, SOU, Southampton on August 15, 2014 by Bruce Drum. 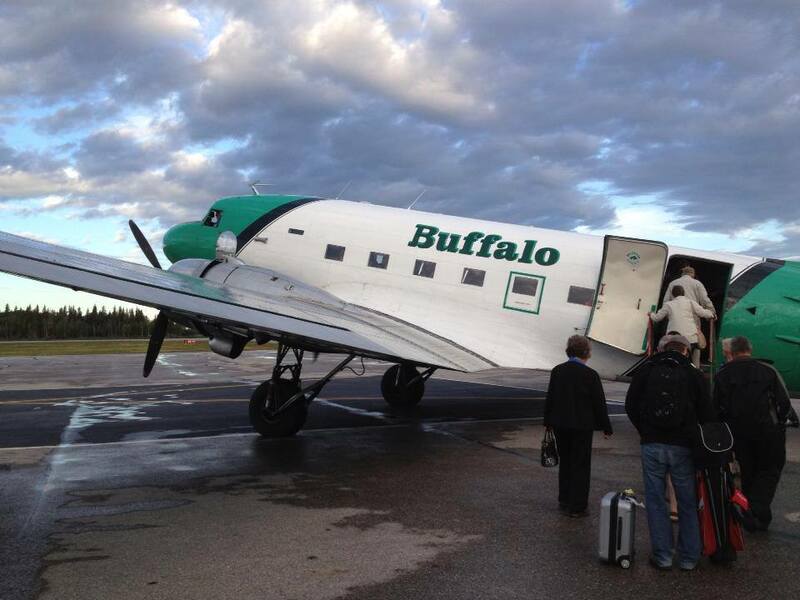 Buffalo Airways (Yellowknife), one of the last passenger operators of the venerable Douglas DC-3 in the world, suffered a hard landing at Yellowknife yesterday evening (August 19). The DC-3 had departed Yellowknife on its regular run to Hay River when it was forced to return to Yellowknife after the right engine caught fire. According to this report by CBC News, the DC-3 clipped some trees and suffered a hard landing. There were no injuries to the passengers and crew members on board. Buffalo Airways is famous as the airline featured in the Canadian TV series “Ice Pilots”. It is not clear if any of the TV production crews were filming yesterday. This entry was posted in Buffalo Airways and tagged Airplane Crash, Buffalo Airways, canadian tv series, Crash, DC-3, Douglas, Douglas DC-3, Hard Landing, hay river, yellowknife on August 20, 2013 by Bruce Drum.